So I’m sitting on the couch about to write this post, armed with a mug of green tea and square of Lindt 70% dark chocolate (my antioxidant hit for the day is well and truly sorted!) Presumably I’m all set to go. I start typing out the ingredients, nibbling away on that square of chocolate. All is well. And then my mind starts wandering. “Hmmm what shall I bake this afternoon? A loaf? Yes a loaf sounds good. What type of loaf? Perhaps a pumpkin one? Or maybe a fruity one?” The next thing I know, the chocolate is gone, my cup of tea is almost finished and I haven’t typed a single word in at least fifteen minutes. Now, I don’t struggle with short attention spans and I pride myself in only daydreaming on the train/bus/when exercising (and perhaps in some super boring lectures – trial balance sheets anyone?). So what’s my problem? As soon as I have finished preparing one meal I can’t help but start speculating about the next. Food is on my mind an awful lot of the time. Probably too much. I’m starting to wonder if one of the lobes in my brain isn’t hardwired to all things food. This habit is certainly not always practical – I swear time speeds up when I’m poring over recipes – however it does produce some pleasing results. 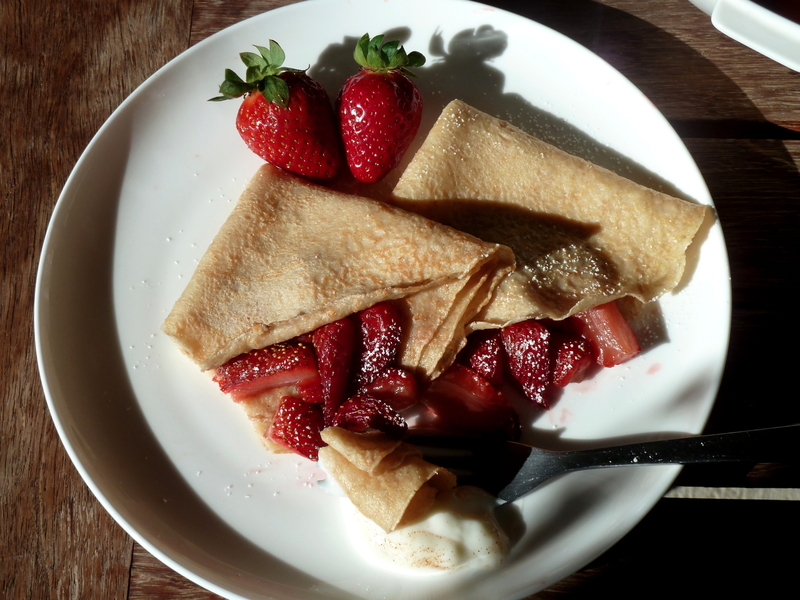 Take these whole-wheat crepes with roasted strawberries for example. Last night Dad and I headed off to the Sydney Swans vs. Collingwood match at Olympic Park (that’s Australian Rules Football for those of you who hail from other nations). I thoroughly enjoyed the evening – it’s fantastic that we live close enough to walk to and from the stadium – however that still didn’t prevent me from musing over what to prepare for breakfast the following morning. The upshot? These whole-wheat crepes. I knew we would want a lazy morning, so simplicity was a must. To jazz them up I decided to try something new (we usually have the crepes with berries, banana and maple syrup or the classic lemon and sugar) and roasted a punnet of beautiful, in season, Queensland strawberries. 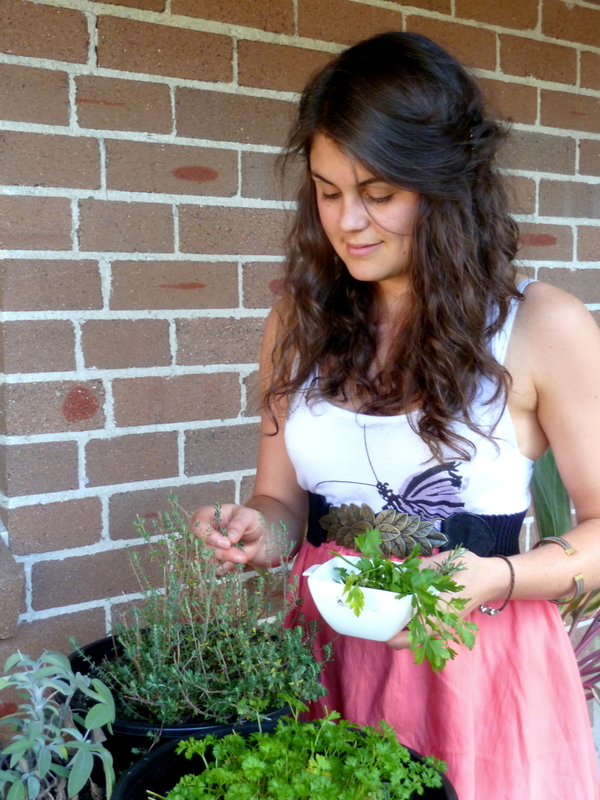 I bought three punnets for just $3 yesterday – a bargain if I don’t say so myself! The roasting was a gamble – would it be better than fresh? – but one that paid off, producing soft, sweet and oh so juicy berries. They paired sublimely with the cinnamon undertones and slight nuttiness of the crepes. A dollop of creamy cinnamon spiced vanilla yoghurt topped it all off wonderfully. I’m already considering how next to incorporate these roasted gems into other meals. White chocolate and roasted strawberry muffins are sounding pretty damn good at the moment. But perhaps that’s getting too far ahead of myself…after all I have that loaf to make first! Serves 2 (makes about 6 crepes). Preheat the oven to 200C and line a baking tray with greaseproof paper. Slice the strawberries in half, or for large ones, in quarters. Arrange on baking tray so that none are overlapping. Drizzle over the maple syrup. Roast for 20 minutes, or until soft and beginning to release their juices, jumbling up with a spoon half way through. Remove from oven and dust lightly with icing sugar. Sift the flours, salt and cinnamon into a large jug (mine had a 1L capacity). Make a well in the centre and tip in the beaten eggs. Using a balloon whisk, start to incorporate some of the flour into the egg. Slowly pour in the milk mixture in a thin stream, whisking constantly to produce a smooth batter with a consistency slightly thicker than pouring cream. Stir through two tablespoons of the melted butter. Try to avoid over beating. Place a 20cm frying pan on a medium-high heat and lightly brush with some of the left-over melted butter. Once the pan starts to smoke, reduce the heat to low and pour in about 1/3 cup of batter, tilting the pan to swirl the batter around so that it coats the base in a thin, even layer. Cook for approximately thirty seconds, or until the bottom is set and just beginning to take on a golden colour. Use a spatula to carefully flip the crepe over and cook for a further thirty seconds, or until the edges are just starting to crisp. Transfer to a plate and cover with a clean tea towel to keep warm. Repeat the process until all of the batter is used up. Fold each crepe into quarters (to produce a triangle shape) and stuff with roasted strawberries. Dollop on some vanilla yoghurt (or ice-cream if you are feeling indulgent), sprinkle with a little extra cinnamon and dust with icing sugar.